WISMEC Predator 228 TC MOD is a smart Mod that is newly launched by WISMEC. Its maximum output power is 228W, which can be driven by 18650 cell. 10 colors available for you to choose. 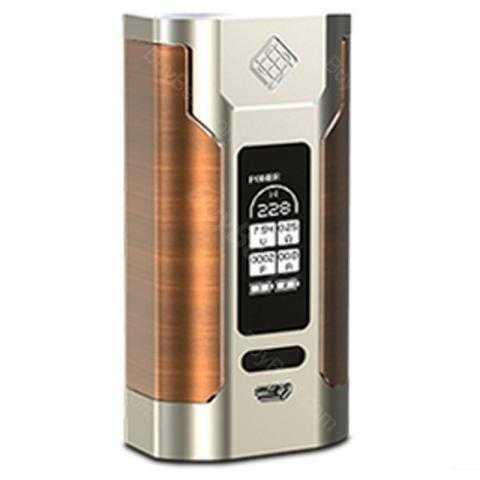 WISMEC Predator 228 TC MOD is a smart Mod that is newly launched by WISMEC. Combining WISMEC’s most advanced technology and the most fashionable design, it is a very popular TC Box MOD. Its maximum output power is 228W, which can be driven by 18650 cell. At the same time, the Predator 228 also has a 2A fast charging system that can quickly charge your Mod so you can use it more conveniently. The Wismec Predator 228 TC MOD also serves as a reverse charging mobile power supply. You can convert the 510 connection to a USB output through a reverse charging (RC) adapter. This newly launched Mod is the crystallization of WISMEC technology and wisdom. Now there are 10 colors available for you to choose. Come and choose your favorite type. Don't miss it. • We suggest you use it with WISMEC Elabo Atomizer. la calidad de este producto me sorprendió muy gratamente. la entrega del producto no tardó mucho tiempo. Gracias Buybest! Excellent quality, good looking, big screen. I recommend. So far so good. A nice little mod. I prefer it to the alien. Good for those starting out and seasoned vapers alike. Even better with Arctic Fox firmware. Extra fast shipping and cheap!! Recommend to everyone that needs a powerfull and small TC mod. Fühlt sich nicht ganz so wertig an, aber dafür ist der MOD sehr leicht. Came really fast. Werry satisfied with the item. Will buy again ! The ultimate and the best dual battery mod from Wismec, compatible with various atomizers, upgradable fw. Well packed, fast delivery, product as described! Satisfied buyer! TODO LLEGO CORRECTO. PAQUETE BIEN EMBALADO Y ENVIO EN TIEMPO.